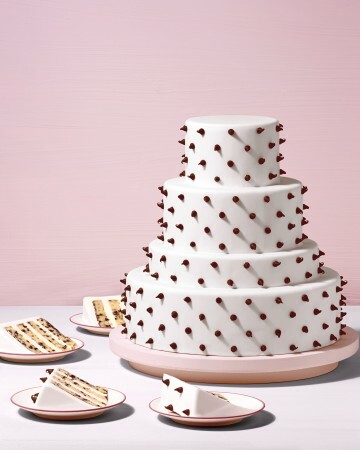 So if you could have a wedding cake that was inspired by a chocolate chip cookie, why would you ever say no? This sweet confection is a four-tier yellow cake featuring chocolate chips, creme-anglaise buttercream icing, and walnut toffee. If you’re not a fan of walnuts (like me) I bet you could skip that part or remove the nuts. What I love most about this cake is the white fondant icing is decorated with chocolate chips. It’s fun and whimsical and really lets your guests know what they’re about to enjoy! This cake would be perfect year-round, but I think it would be a lot of fun for a fall wedding! And you can continue the theme with some mini chocolate chip cookies as a wedding favor. This cake was created by Jason Schreiber. You can find out more information here.